Yankee, Lima, and Tango: Regular visitors to Governor’s Island may know that these are names of three piers on the southern shore of Governor’s Island, each named for the letter that represents their shape: Y, L, and T. Regular visitors may notknow, however, that these piers are now the sites of three nesting areas (colonies) for common terns! The nesting population has been growing for the past several years, and this year our team from NYC Audubon, the National Park Service, the Trust for Governors Island, Earth Matter, the Harbor School, and the LiRo/Turner group counted 152 nests at the end of June: 80 on Yankee, 62 on Tango, and 10 on Lima. 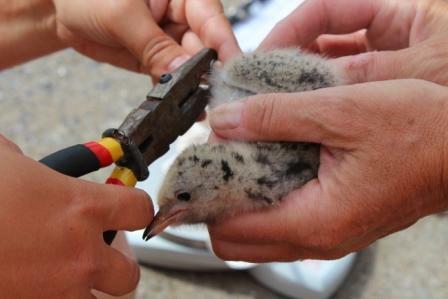 To help the New York State Department of Environmental Conservation and NYC Audubon learn more about the terns, which are listed as a threatened species in New York State, we banded 100 chicks and 10 adults. We look forward to continued work monitoring this new colony. 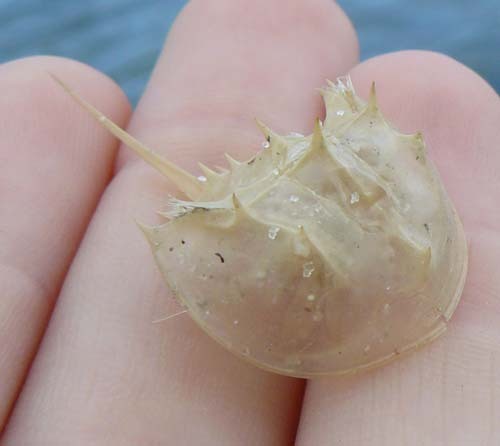 The U.S. Army Corps of Engineers is set to start Phase II of their work on Brooklyn’s Plumb Beach, and NYC Audubon is advising the Corps on how to tread lightly around something they might not even be able to see: baby horseshoe crabs! Right before Hurricane Sandy hit, the Army Corps completed Phase I of the project, during which they added new sand to the eroding beach in an effort to protect the adjacent Belt Parkway. Phase II, set to begin in July once the majority of horseshoe crab spawning is complete, will involve building permanent stone groins and a breakwater to mitigate future beach erosion. New vegetation being planted on the dunes and a fence will also help protect the Belt Parkway and a popular bike path from drifting sand. While the Army Corps has been preparing for Phase II, the parking lot to the beach has been closed to the public. 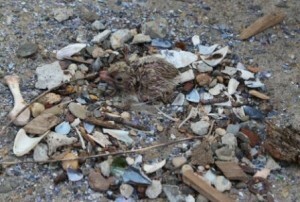 However, NYC Audubon had been granted access to the beach throughout May and June to monitor the horseshoe crabs that come to Plumb Beach in large numbers during the full and new moon to spawn. And though they arrived a bit behind schedule, horseshoe crabs have indeed returned to Plumb Beach in strong numbers this year, despite the changes made by Sandy and the Army Corps (close to 1,800 crabs counted over 12 nights, compared to around 1,300 in 2012). While numbers of spawning crabs are winding down at this point, heavy machinery and construction on the beach could mean bad news for the hatching larvae. 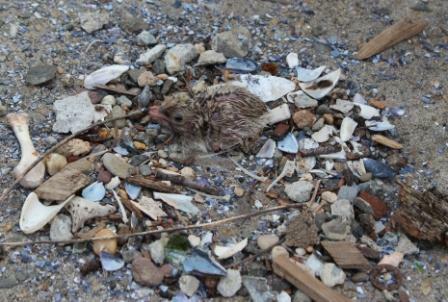 NYC Audubon and partners at Fordham University and the National Park Service are working with the Corps of Engineers to minimize disturbance to hatchlings while respecting the deadlines that have been contracted for the work. On June 20th, a team of NYC Audubon staff, interns, and volunteers traveled to Swinburne Island to band young double-crested cormorants. 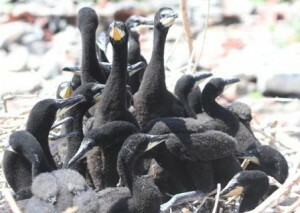 This long-abandoned island, at various times home to a quarantine hospital and a Merchant Marine training station, has in recent decades become a popular nesting site for a variety of sea birds, including the double-crested cormorant. Once an imperiled species, the double-crested cormorant has made a tremendously successful comeback in recent years. In order to gain a better understanding of this recovery, NYC Audubon has been banding cormorants on Swinburne Island since 2006. After arriving on the island, the team scouted the various cormorant nesting sites–the birds had built a large cluster of nests on the ground, but many more were up in the island’s few remaining trees, and all were full of young birds. The largest chicks were removed from the nests and brought to a holding pen in a nearby clearing, where they waited their turn to be banded. The birds were carefully wrapped in towels and held while each of their legs received a different identification band. The numbers on the bands were recorded, and then each bird was returned to their nest. In total, the team was able to band 85 birds during their three-hour visit.